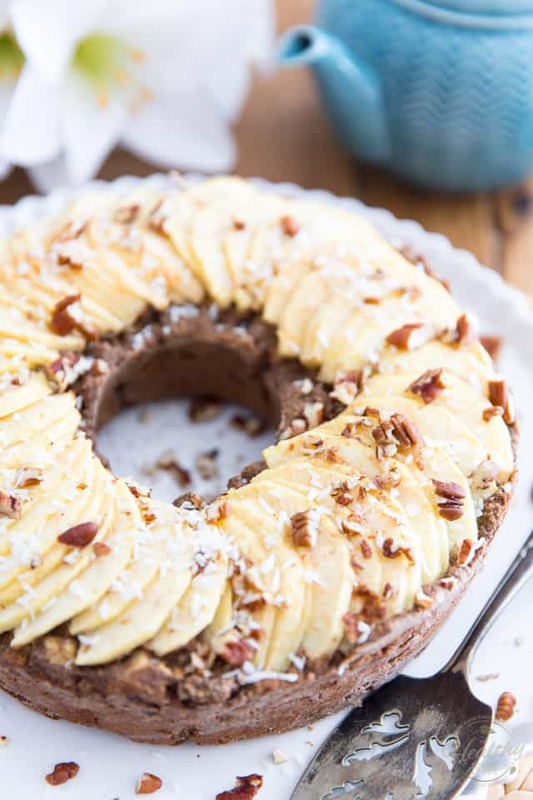 Cakes don’t get much healthier than this Buckwheat Apple Ring Cake. On top of being completely vegan, it also happens to be free of gluten and refined sugar. Of course, it’s also absolutely delicious! 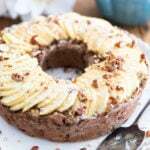 This Buckwheat Apple Ring Cake I originally created ages ago, in March of 2012 to be exact, after a friend had challenged me to “heatlthify” an apple cake recipe he’d found on the Internet. I’d readily accepted his challenge and practically reinvented the thing… Not only did I manage to keep it vegan, like the original, but also made it gluten and refined sugar free. 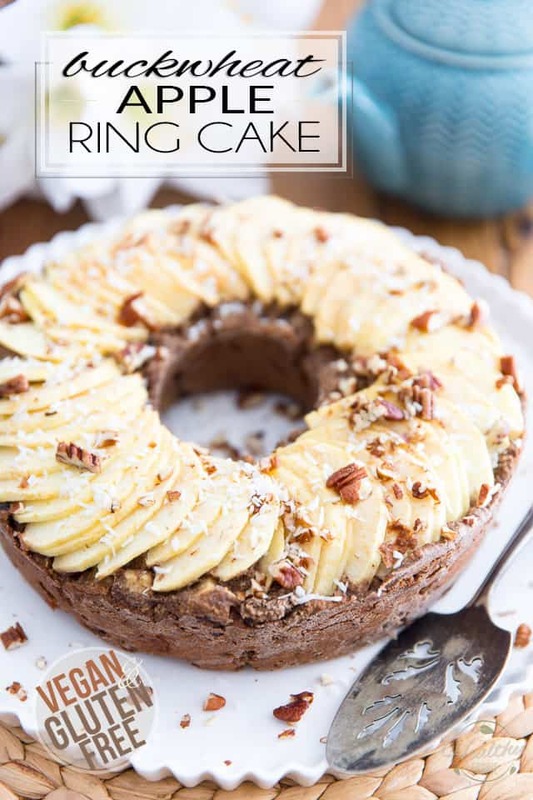 Indeed, the only ingredients in charge of bringing sweetness to this gorgeous ring cake are apples and raisins. Yet, it tastes plenty sweet to be enjoyed as dessert! HA! I’m telling you, cakes don’t get much healthier than this one. Especially not cakes that taste this good! This one has a really dense yet surprisingly moist texture, and offers very pleasant and distinct notes of buckwheat, which remind me of my childhood’s breakfasts, when my dad used to make buckwheat pancakes for us. Paired with apples, it’s like a match made in heaven! Oddly, though, since I’ve originally created that cake, many people have reported in the comments that the recipe didn’t work for them. I felt the need to retest it for myself, without changing a thing to the recipe. This is exactly what I did here, and it came out just as perfect, if not better than the first time. At least now I’m reassured, and as a bonus, you get to have step-by-step pictures, which I didn’t do back in the days. Oh, and I got to eat cake, too! And that, is never a bad thing! When baking, it’s always best to start with a good mise-en-place, which means prep, measure and weigh all your ingredients before you start cooking or baking. Your first step should be to preheat your oven to 350°F, then grease and flour a 9″ tube pan; you could use any flour you like to do that, but I strongly suggest that you use buckwheat flour in order to keep your cake gluten free. 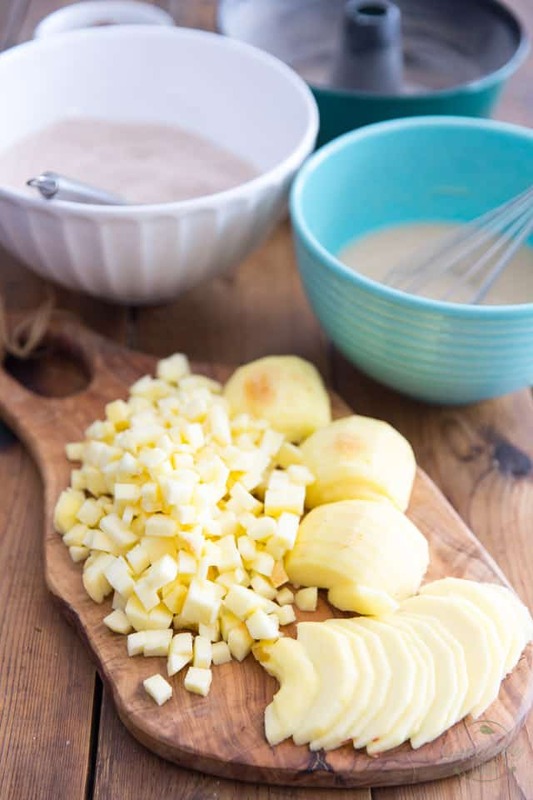 Then, peel and core 4 baking apples — I used gala but feel free to use your personal favorite — cut them in half and then cut 2 of them into tiny little cubes and slice the other 2 as thinly as you can. 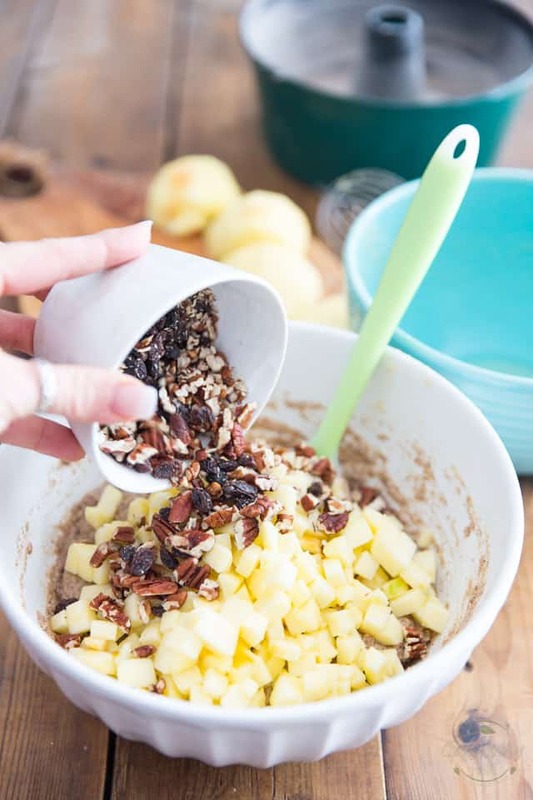 While you’re at it, might as well measure your chopped pecans and raisins; you’ll need 1/2 cup of each. 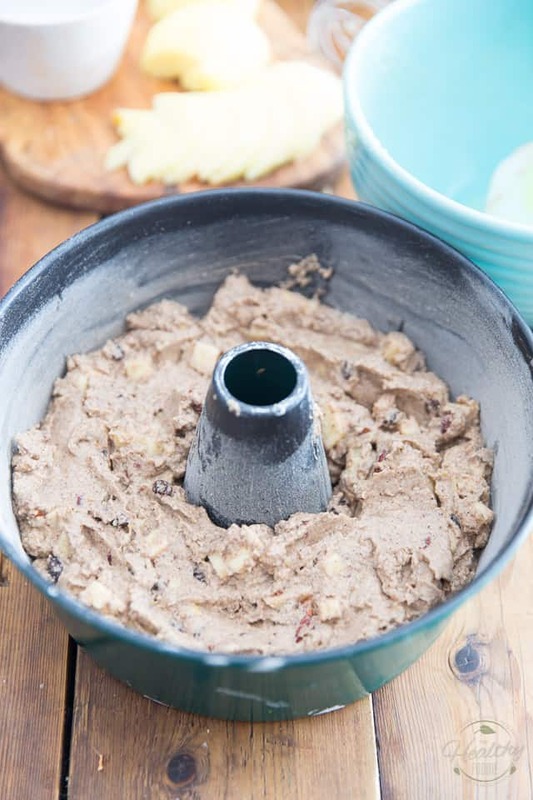 … and mix delicately with a wooden spoon or rubber spatula until just incorporated. 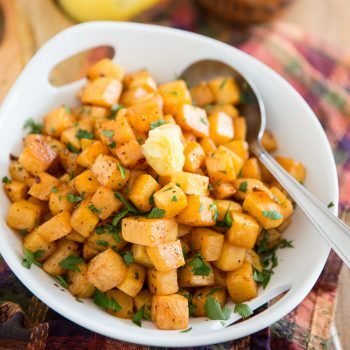 Throw in the cubed apples, as well as the raisins and chopped pecans, and fold them in delicately. Transfer the batter into the prepared ring pan and spread it as evenly as you can. Finally, arrange the apple slices around the cake, pushing them lightly into the batter. Time to bake that cake! Place it on the middle rack for 40-45 minutes, or until a toothpick inserted into the cake comes out clean. Once it’s out of the oven, you’ll want to let your cake cool in the pan for 5-10 minutes, and then take it out of that pan. To do that, lay a flat plate over the top of the pan and carefully flip the cake over onto that plate. Lift the pan off and place another flat plate over your cake and again, carefully flip it over so the nice, top side of the cake is back up. Now sprinkle the top of your cake with a little bit more chopped pecans and a pinch of shredded unsweetened coconut, if desired. This cake is equally good served warm or cold, so ultimately, the choice is yours! 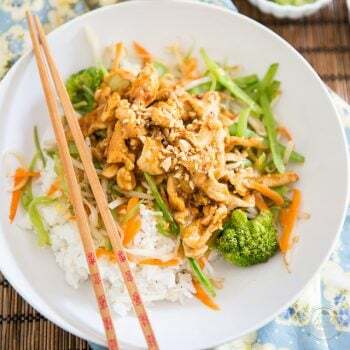 Leftovers should be kept in the fridge, though, seeing as how it contains no sugar to help preserve it at room temperature. When ready, slice your cake up, and serve! If you feel like indulging a little, or are in need a little more sweetness, drizzle a little bit of pure maple syrup on top; it goes perfectly well with it! 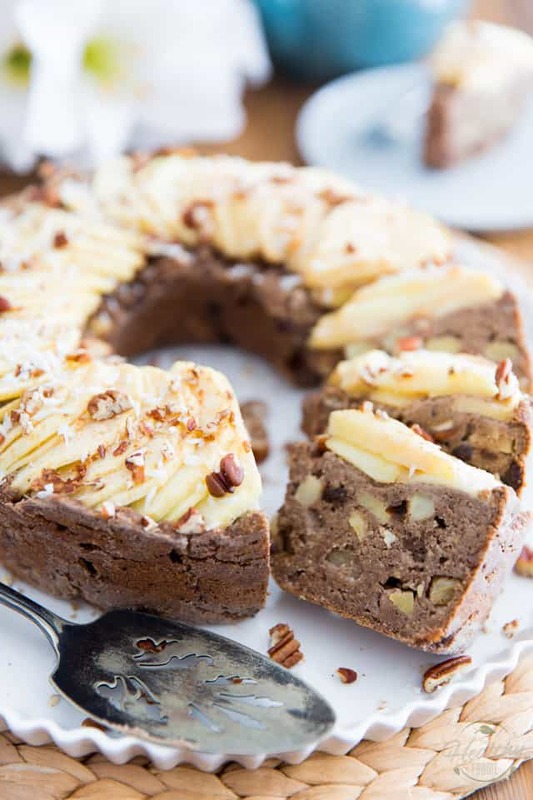 Cakes don't get much healthier than this Buckwheat Apple Ring Cake. On top of being completely vegan, it also happens to be free of gluten and refined sugar. Of course, it's also absolutely delicious! Preheat the oven to 350°F. Grease and flour a 9" tube pan* (use buckweat flour to keep the cake gluten free); reserve. Peel and core your apples, then cut 2 of them into tiny cubes and slice the other 2 as thinly as you can. Set aside. 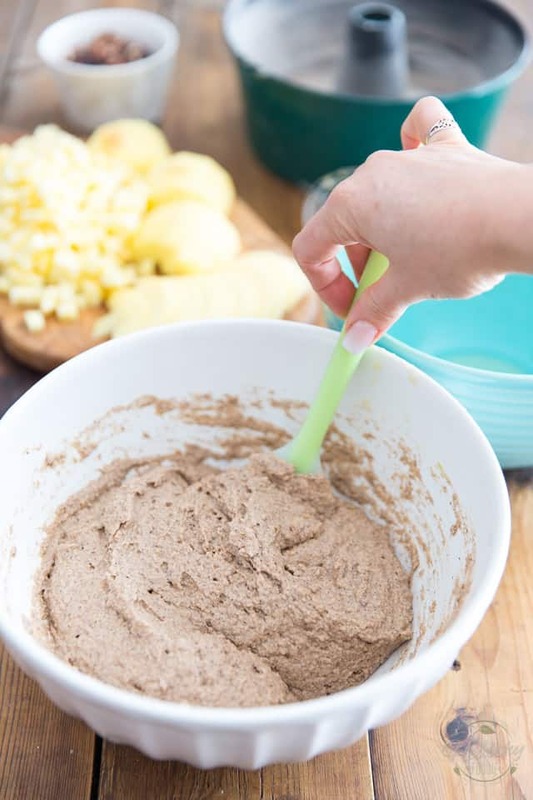 In a large mixing bowl, combine the dry ingredients and whisk until fully incorporated. 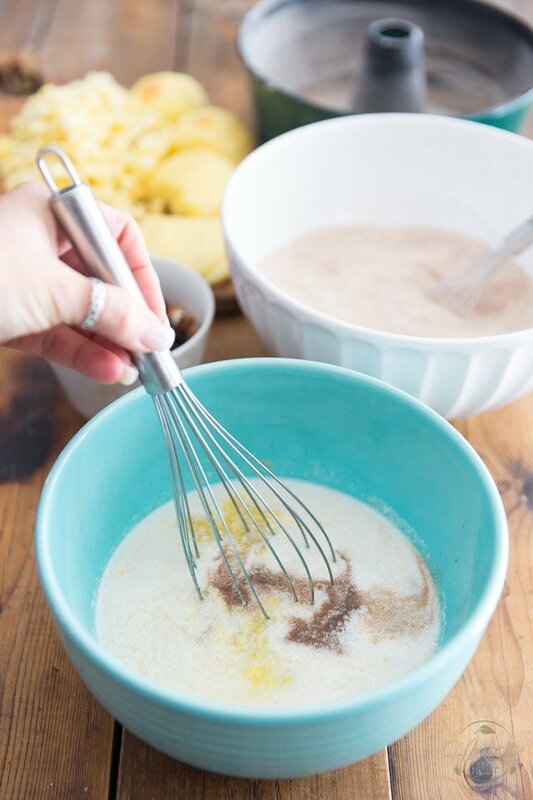 In a separate bowl, combine the wet ingredients and whisk vigorously to combine. 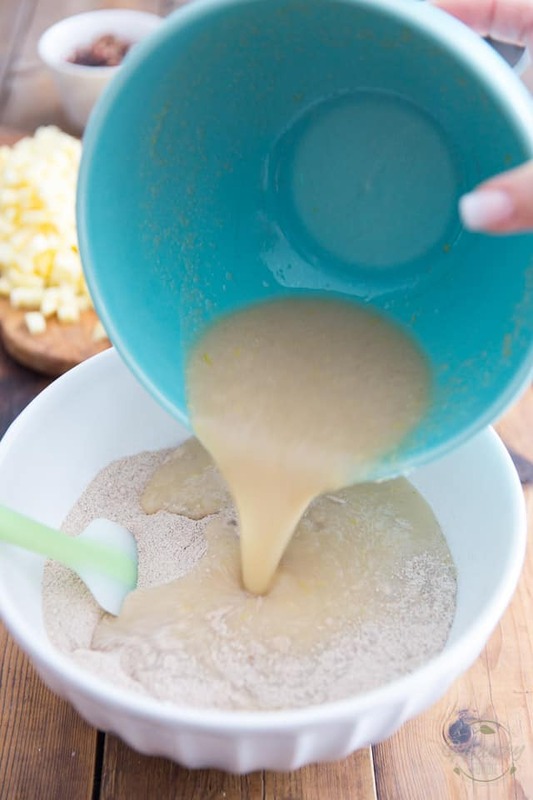 Pour over the dry ingredients and mix delicately with a wooden spoon or rubber spatula until just incorporated. Add the cubed apples, raisins and chopped pecans and fold them in delicately. 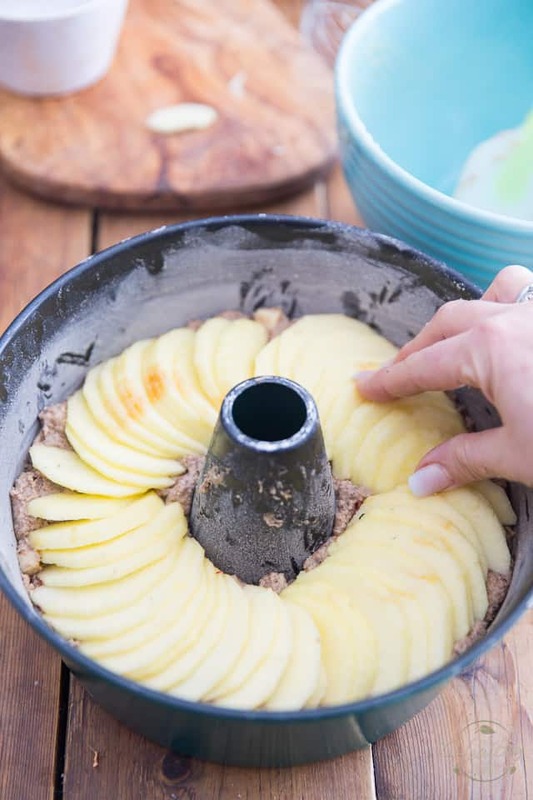 Pour the batter into the prepared ring pan, spread evenly and arrange the apple slices around the cake, pressing them lightly into the batter. Bake on the middle rack for 40-45 minutes, or until a toothpick inserted into the cake comes out clean. Allow cake to cool in the pan for 5-10 minutes, then lay a flat plate over the top of the pan and carefully flip the cake over onto that plate. Lift the pan off and place another flat plate over your cake and again, carefully flip it over so the top side of the cake is up. 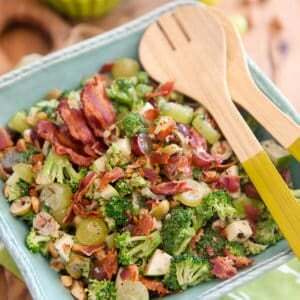 Sprinkle with more chopped pecans and a pinch of shredded coconut, if desired. 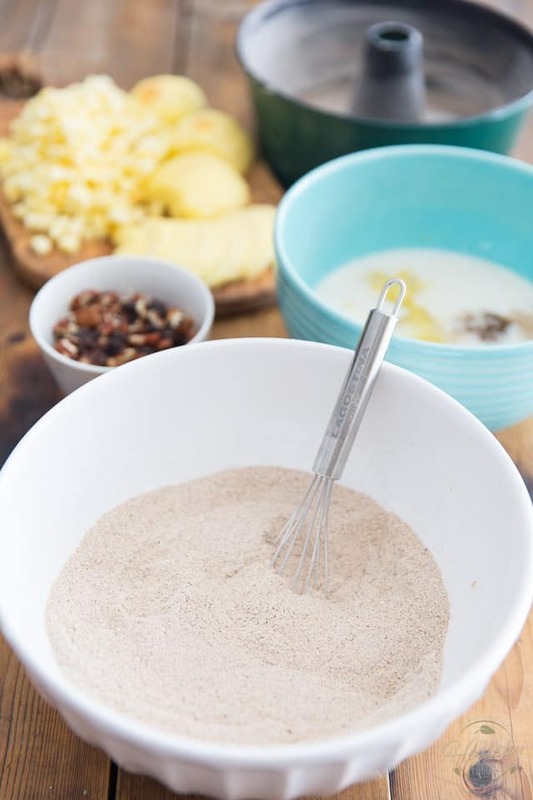 *You can make your own gluten free baking powder at home by combining one part baking soda, two parts cream of tartar and two parts non-grain starch, such as tapioca, potato or arrowroot. *Based on the experience of many, this cake must absolutely be baked in a tube pan. No other pan ever gave conclusive results. *Editor’s Note: This post was originally published in March of 2012 and has since been completely revamped and updated with better wording and pictures. No modifications to the original recipe have been made. Sonia, you can read my mind! I was craving apple cake for the past three days, but couldn’t find a recipe that is sugar free, grain free, gluten free, vegan and all those things. And I was too lazy to experiment myself. Now you delivered. Gotta love you for that!!!! You think if I ha;lved the recipes it would work in a regular loaf pan? That’s too funny Anja! It’s almost like you placed an order… 😉 I really wouldn’t see why half a recipe wouldn’t work. You might want to cook your loaf a little less longer though, but apart from that, it should work just fine! This is wonderful. Love a cake that’s healthy and yummy! So pretty too! I can’t wait to try this. I’m really curious to see what you come up with in the next couple of weeks. Wow…I have all of the ingredients in my hollow…echoing ..rather EMPTY Lenten cupboards!! 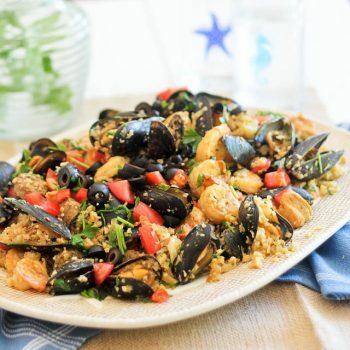 !..Except no soy milk…I DO have buttermilk/kefir liquid…could this work?…Gorgeous presentation…No wonder you have no “Lent Deprivation Feelings” regarding this creation…Bravo! I really wouldn’t see why not. In fact, if I hadn’t wanted to keep mine vegan, I’d have used buttermilk. I love using buttermilk in baked goods. Well, in fact, I love using buttermilk in all sorts of things. It just makes everything better, I find! Must get buckwheat flour and make this *now*. I love the sliced apple ring around the top; it really is a beautiful presentation! I’ll look into the buckwheat groats. That’s a good idea so thanks! Ok is it bad that even though I’m not hungry and it’s 22h11 right now, I have this urge to go to the kitchen and make this cake asap? This is so drool worthy and yet guilt free… And thanks to your recommendation store wise, I’ve got all the ingredients at home, including the sarrasin since I had the urge to make some crêpes breton style this morning! I love to bake and not having any food restrictions except for an abhorence for butter ( I know, sacrilėge but I just hate the smell), I rarely find myself substituing ingredients or not indulging in decadent desserts. I just love the fact that your blog is teaching me to bake differently! So I owe you my thanks! As a sidenote, do you think I could play around with the flours ( inverser les proportions d’amande et de sarrasin, ou substituer la farine d,amande avec celle de noisette ou de noix de coco)? Hey Élise! Glad I could make you itch to bake a cake so late at night! I take that as quite the compliment! Hey, no shame in not liking butter. All the better for you, in fact. I’m not a big fan of butter myself, but I have to admit that I sometimes find it really hard not to use it in baked goods. Mind you, I’ve been getting fairly good results so far, so I guess I’ve really learned to live without it. As for playing around with flours, I guess it could be done. Of course, the end result would be slightly different, but should still work. Not sure I would completely switch buckwheat and almond, maybe just go half and half? 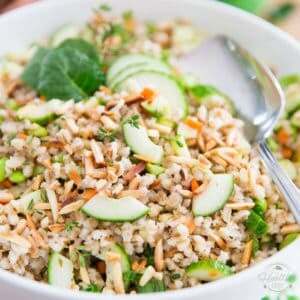 As in up the almond and lessen buckwheat to come up to required quantity. I’ve never worked with hazelnut flour, but I’m guessing you could very well sub using a one to one ratio. As for coconut flour, this one is so absorbent, you would probably need to use a lot less, or adjust liquid accordingly. I just made it and it was delicious! This recipe is a definitely a keeper. The only problem is that I keep eating lol (I feel less guilty because it’s healthy— but still I need to stop before I eat the whole thing in one day. Wow, you tried this already? That was quick! It is pretty good, isn’t it? Hard to stop eating it. 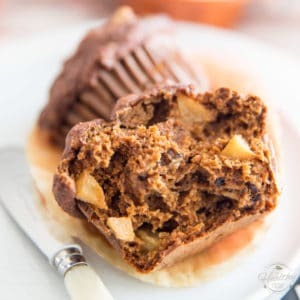 I had to cut mine into presized servings so I wouldn’t constantly cut out a thin slice, just to munch on, you know… And now you got me craving more, especially with your “warm out of the oven with almond butter on top” comment! Oh my! I soooo can taste it! So you used half buckwheat and half almond and it worked great? That’s really good to know. I bet almond and vanilla extract are fantastic in there too. I’ll have to keep that in mind for the next time I make it. When I saw the picture of your cake, I knew I had to make it asap. I am also following lent and trying to stay away from sugar so this is perfect. Plus, I had all the ingredients on hand! The batter came together very quickly but baking was another issue. I just pulled it out of the oven after 1h20mins and it is still kinda goey inside. I’m trying to figure out where I went wrong… I halved the recipe and used a loaf pan instead of a tube, perhaps that had something to do with it since the hole in the middle of the tube helps the cake bake evenly inside and out. Do you use store bought buckwheat flour or do you grind your own from whole buckwheat? What was the texture of the cake like when it came out of the oven. Was it completely firm to the touch, like a normal cake? Thanks in advance for your help. I can’t wait to try it again. This is my kind of cake! 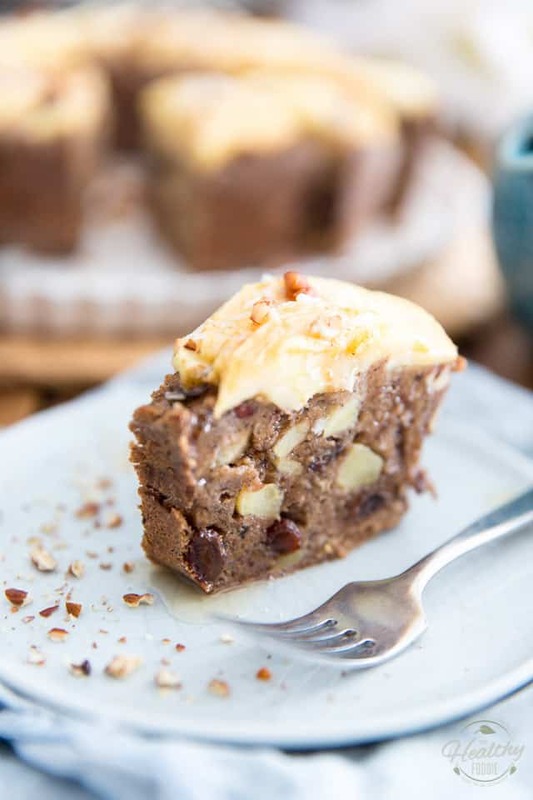 I love buckwheat flour cake and I am a sucker for almond flour and flax – this one is a winner! i saw this cake and I knew! I have to make it for my mom’s bday! but i dont really have buckwheat flour,flaxseed meal, and almond meal on hand. But I’ll be heading to whole food to look for it! 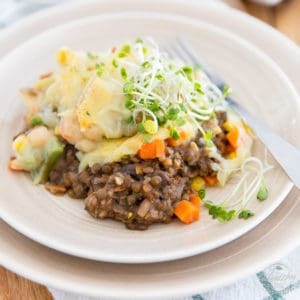 Just a question if i cant find the buckwheat flour and almond meal can I sub it with all-purpose flour and oat flour? I dont really want to mess it up! and the amount of the ingrediets should be the same right? lol sorry one more question! would 9″ cake mold be good enough for this recipe? Well, that would make for quite a few adjustments, so I can’t tell for sure what the results would be. I don’t foresee subbing the flours as being a problem, and I would definitely go with a one to one ratio. I’m really not advocating the use of all-purpose flour though, so I would strongly suggest you at least use whole wheat… 😉 Besides, whole wheat would be more “true” to what the texture of this cake is supposed to be like. It is a very dense and heavy cake, after all. To be honest, I’ve never used millet flour in my entire life, but I don’t think that it would be a problem to use this instead of buckwheat, seeing as how gluten is not needed here, and this cake is extremely dense to start with… and I would imagine millet flour to have a rather dense consistency! And it wouldn’t make the cake any less nutritious, just different. If you do try it, let me know how it turns out! I always appreciate that very much! REALLY? That is so strange. You are the second person so far to have tried this in a regular pan and have the cake fail on them… So maybe that cake absolutely has to cook in a tube pan… must be a question of heat conduction. I will have to test it myself, I guess… ‘cos I’m definitely all curious now! Mine was really far from gooey on the inside. It was really firm and dense, well, as the pictures pretty well depict, I think. I am truly puzzled. Thanks for your feedback … I was truly disappointed yesterday (and sad to throw all the expensive ingredients in the rubbish!) however these things happen. I am determined to try this again some day! 🙂 I wonder if you can make muffins of this batter? Hmm …..
Oh, yay! It’s not something I was clever enough to think up myself – something in the back of my mind was telling me that I’d seen a recipe for ‘caramel’ made from dates on Pinterest a while ago. I haven’t tried it myself yet, but I’m certain it must be lovely, and I think it would go really well with this recipe of yours. I’ve dug out the link for you in case you’ve not yet seen it. http://vkreesphotography.com/apple-with-salty-medjool-caramel/ I can’t wait to try them both out together!! I am so excited about trying this cake!!!! It looks awesome! However I have 2 questions….the first is that I am looking for “grain free” but isn’t buckwheat a grain? Because of my sugar level I was told grains turn to sugar and this is why I feel headachey, bloated and exhausted after eating them. Also, is there a way to modify this recipe for a regular baking pan? I don’t own a bundt mold Thanks! Happy to hear that this cake tickles your fancy, Trish! To answer your questions, technically, buckwheat is not a grain: it’s actually a fruit seed that is related to rhubarb! It makes an excellent grain flour replacement in baked goods! 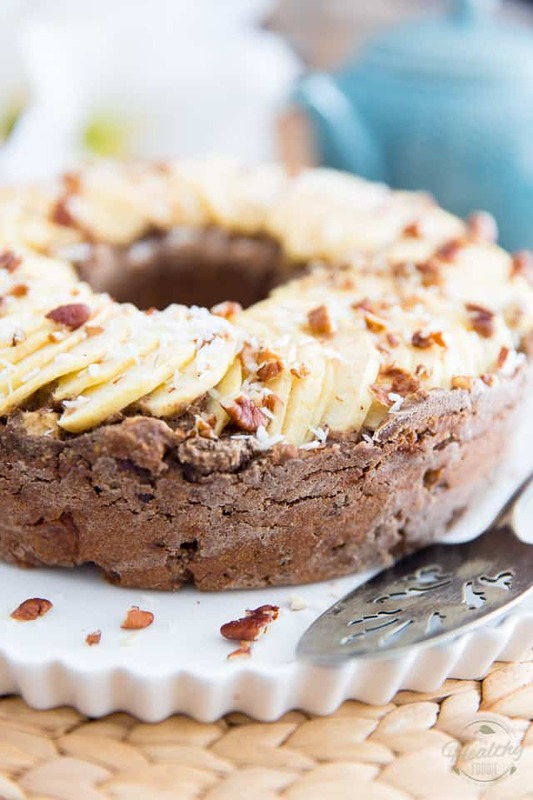 As for using a regular pan, 2 people have attempted it so far, with less than conclusive results, so I would strongly suggest investing in a bundt pan if you want to give this cake a try. Better spend your money on a pan that will last you than on ingredients to bake a cake that risks not turning out and ending up in the trash. 😉 I will have to run some tests at home and see if it can be made into a “regular pan” kind of cake. I would like to make this for my son’s 1st birthday cake! Do you have any tips/pointers/modifications if I made these cupcakes? This sounds yummi! It says 1/4 flax meal, but it doesn’t say a measure? Cup? That would be correct, Natasa. Thanks for mentioning the typo, I made the correction in the recipe! just made this cake into 12 muffins! 35 minutes in the oven, perfectly done! Dear Sonia, I would love to try this cake. From my experience, healthier cakes turn out to be dry. I was wondering what keeps this cake moist? Also, did you ever figure out whether it was possible to bake this cake in a non-ring pan? Thanks so much! I wouldn’t suggest baking it in a non-ring pan… a few people have tried it and didn’t have much success. Thanks! Also- from my first question, what keeps this cake moist? A typo: “…you can make your own cornstarch at home using one part baking soda…”. I think you meant BAKING POWDER, not CORNSTARCH. I appreciate that this is an oil-free, no-added-sugar cake, but this cake is truly missing some sweetness. That said, I might try making this again one day and blend a dozen or more Medjool dates to the soy milk to sweeten it up. I tried making this recipe today and hadn’t read all the reviews till bottom, the cake had so much moisture and wasn’t cooking, I have to throw this away. Not sure if the liquid content on the recipe is incorrect? 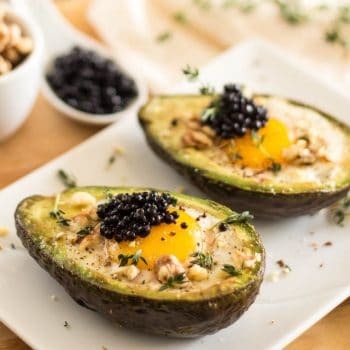 I am a lover of your Paleo book and have almost worn out pages especially the carrot salad and crunchy broccoli salad among many other recipes! I applaud your entire journey changing to vegetarian lifestyle. 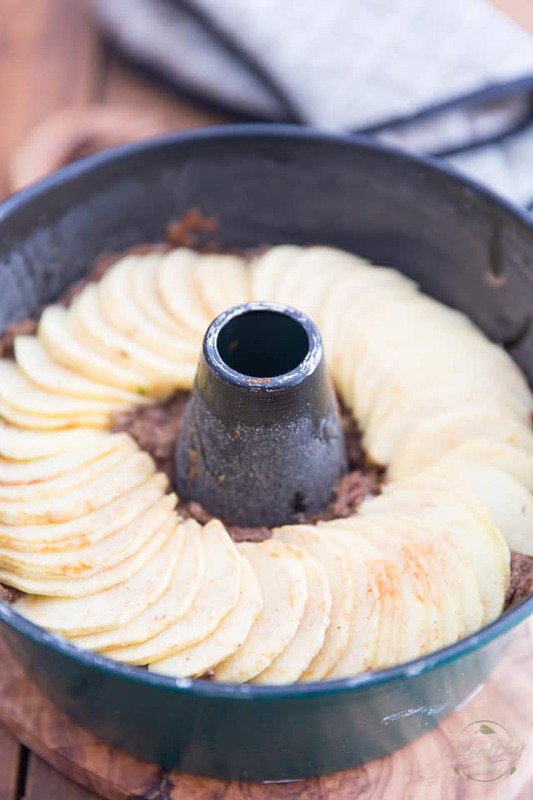 Imagine my surprise when I made the Buckwheat Apple Ring cake and it was such a taste disappointment. Beautiful, but lacking any sweetness to hide the cardboard flat taste. There was a lot of applesauce in the batter as well as raisins, but it’s not enough Also, needed a touch more salt. My husband won’t even eat it! I put some maple syrup on it, a small sprinkle of salt and stevia and that helped a lot! I guess I’ll be eating the rest of it indulging it with maple syrup. Cake required an additional 10 minutes for me too. 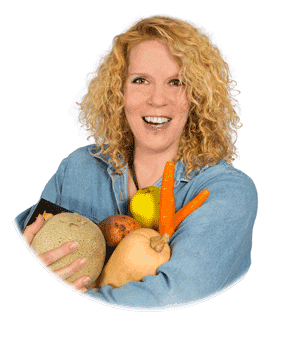 I’ve been Paleo for over five years, a health devotee for 40 years and now a certified Holistic Health Coach. All long enough to be fine without sugar. About how much maple syrup or honey would work in the recipe? Still a big fan of all your wonderful recipes!